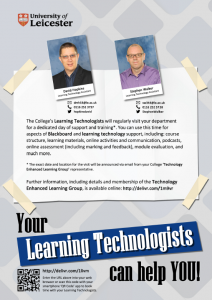 The next hot desk visits from your college Learning Technology Assistants will be at the end of January. We felt that the timing of the December hot desk, a week earlier than normal, would be too soon after the previous visit, and the last week of term before Christmas is not an ideal time either. We are of course still available via email or by phone at any time.